A quick repost for you today. I actually like reposting every now and again because I'm reminded of what I've done in the past, and have completely forgotten about! I can usually recall most of my posts, but this one had totally left me. I'm glad I stumbled upon it again because I need reminded of this every now and again. I'm not sure where I came across this quote, but I absolutely love it! Aren't the words beautiful? I have to say I completely agree with Mr. Chesterton. 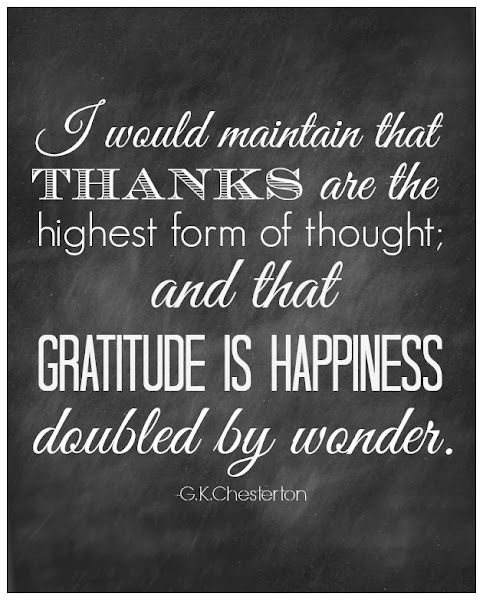 Some days it seems nearly impossible to be thankful, doesn't it? I believe that's why he says thanks are the highest form of thought. Anyone can complain, be envious of what other have, but it takes a certain training to cultivate thankful thoughts. I can speak from experience, that the effort involved in having higher thoughts is completely worth it! My life is such a much happier place to be when I live in thanksgiving every day. I am also a lover of this kind of post. But the near thinking is that you have represented the matter as per as your opinion & people are also loving that. Thank you so much for your excellent post. Love the post you shared. Gather lot of information from your blog. Thanks for sharing your resources.